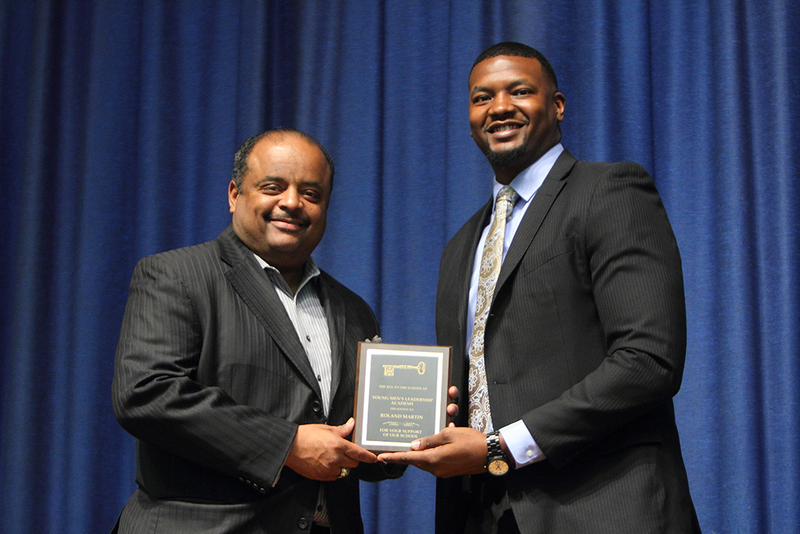 Principal Dr. Chris Barksdale, right, presents a plaque of appreciation to Roland S. Martin on Wednesday, April 18. Award-winning journalist Roland S. Martin visited Dallas ISD’s Young Men’s Leadership Academy at Florence on Wednesday, April 18, to motivate students to be more intentional with their time and effort and make positive choices now. Martin’s career ahas had him interviewing the top newsmakers, including U.S. presidents, top athletes and entertainers. Notably, he is currently the host and managing editor of TV One’s “News One Now,” which stakes a claim as the first daily morning news show to focus on the news of the day from an explicitly African American perspective. Everything the students do today sets them up for the following years. “When I was your age I was not joking around,” he said. Martin’s visit was made possible in part by UNT-Dallas. He was invited to the school by UNT-Dallas Distinguished Leader-In-Residence Michael Williams, who is a former Texas Commissioner of Education.